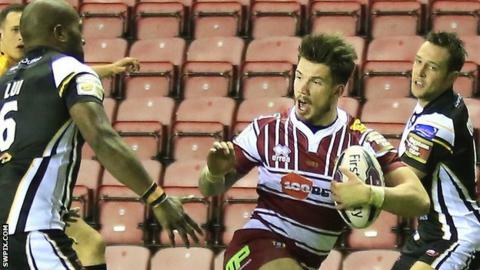 Oliver Gildart grabbed two tries as Wigan scored late to beat Salford, who staged a spirited second-half comeback. Gildart's two first-half tries helped the hosts lead 10-2 at half-time. Anthony Gelling went over for Wigan's third try, but successive scores from Salford's Junior Sa'u and Josh Griffin reduced the deficit to six points. The visitors then drew level thanks to Ben Murdoch-Masila's try, before Dom Manfredi won it for Wigan with four minutes remaining. Victory for Wigan moves them to the top of the Super League table for the time being, with three wins from three matches. Gareth O'Brien's penalty had put Salford ahead after only four minutes, but the lead was short-lived as Gildart darted through the Red Devils' defence to score on the left wing. A fantastic team try extended Wigan's lead as Lewis Tierney and Gelling made ground down the right, before Taulima Tautai and Matty Smith combined to set up Gildart for his second try. Wigan's eight-point half-time lead was added to when Tierney sent Gelling free to score through the middle of the Salford defence. Two tries in 11 minutes brought the visitors within six points as Sa'u latched onto Michael Dobson's kick and Griffin dived in at the right-hand corner. Murdoch-Masila went over from close range to level the scores and give Salford hope of a third win this season. But Wigan won it when Gelling's run to the corner was finished off by Manfredi for a try which Salford thought should have been disallowed because of a knock-on. "We showed some toughness. We were dumb with the ball and there were some poor skill errors, but I put a bit of that down to fatigue. "It's a win but I'm disappointed with the manner in which we got it. We're three [wins] out of three and we've not played well yet. "They've a very strong team and have a lot of good players, so I have to be happy." "I'm really disappointed with the way it ended because it looked like we should have had a share of the points. "The fact he knocked on at the last play-the-ball before the score doesn't help, and the fact that we could see it in the stand and the referee and his officials can't is a big disappointment. "We gave them too much respect in the first half and you can't do that to teams like Wigan,"
Wigan: Tierney, Gildart, Gelling, Sarginson, Manfredi, Williams, Smith, Sutton, Powell, Flower, Bateman, Farrell, O'Loughlin. Replacements: Clubb, Mossop, Tautai, Burke. Salford: O'Brien, Carney, Sa'u, J. Griffin, Johnson, Lui, Dobson, Kopczak, Lee, G. Griffin, Murdoch-Masila, Jones, Flanagan. Replacements: Tomkins, Krasniqi, J. Walne, Evalds.